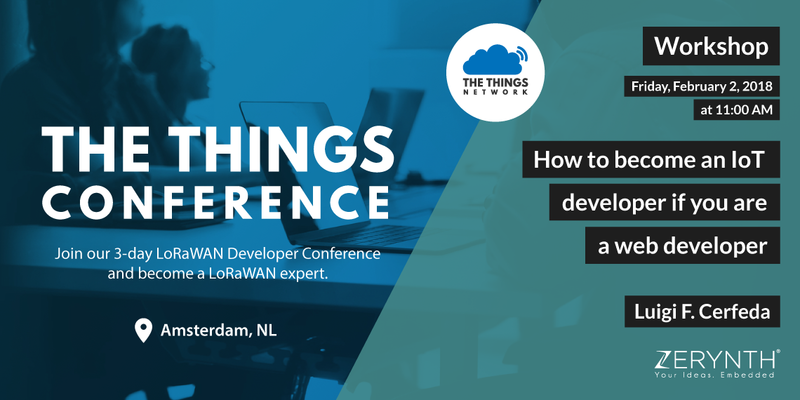 Python and LoRaWAN were hot topics in Amsterdam during The Things Conference. The hottest topics it would seem, from the number of people who decided to join us in our workshop: “How to become an IoT developer if you are a web developer”. A sold-out venue – it was as if we were a rock band and not a group of engineers. First of all, we would like to thank everyone who participated. We are very proud that you all trusted the Zerynth team enough to come and learn from us about LoRaWAN, Python, and IoT development. It is a field that is growing every day, and it’s only to get bigger. So it is safe to say that a new generation of IoT developers is in the making. We would also like to thank The Things Network for organizing the whole conference and bringing us all together. It was a true melting pot of new ideas and projects. So here is to hoping that next year we will collaborate again. LoRaWAN and IoT development can be a piece of cake, when you are using Python. A few lines of Python, Mikroektronika’s LoRa click that enables sending data over the LoRaWAN and you are done. If you are carrying an idea for the next best IoT project in your head, and you don’t know where to start, Zerynth Studio is an excellent place to begin. Code in Python, connect your device to the Cloud, make adjustments and tweaks – before you know it your prototype will become a final product. Let us know if you have any questions about the workshop, and if this is a topic you would like to see us cover again.